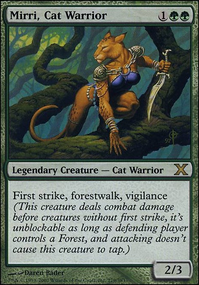 Basically Mirri Enchantress, as inspired by Shoe of Wooberg.net. Made some changes, omitting some of the more key Green Ramp spells in favor of lesser ones (hence the hefty land count), as well as some of the more idiosyncratic and historically cool pieces of tech that Shoe has and likes to play. One of the additions I'm most proud of is the Urza's Saga "Hidden" cycle, which work really well with our card draw engine. Woodland Bellower, Caustic Caterpillar, and a Reclamation Sage were added post Magic Oranges. Retreat to Kazandu, Fertile Thicket, and Blighted Woodland were added post BFZ. Why can't I hold all these forests!